The RD3/RD4 can be ordered in several different configurations depending on the customer’s needs. There are two options for the outer drum and three different types of door leaves to choose from, each with a different look and feel. Depending on the rail and panel options selected, the door can produce varying degrees of interior privacy. The RD3/RD4 is available in various sizes with flexible internal height and fascia height to match any building. 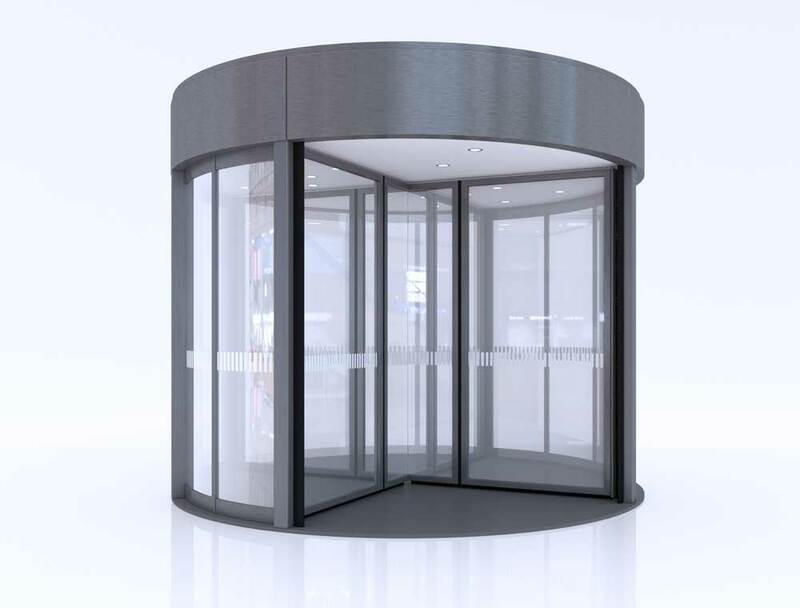 All of our revolving door systems are made from Besam-designed aluminium profiles which can be anodized, powder-coated or stainless steel-clad. The drive mechanism is fitted on a frame above the laminated ceiling. The drive shaft bearing is fixed to the finished floor. Brushes seal the door tightly. The doors are designed to be placed and fixed directly onto the finished floor surface. No special foundations are required. For unfinished floors, a ground ring is available as an option. This unique and state-of-the-art control system was developed by Besam specifically for use with its products, and the result is a fully integrated entrance solution with no compromise in design or function. The system ensures lowest operating/maintenance cost, highest safety and best availability. The RD3/RD4 can be equipped with a program selector with access codes to operate the door. Light switches off automatically in locked position. Automatic event log showing the 600 latest events. The maximum rotation speed is factory pre-set, but can be adjusted to suit different applications. The door cannot be manually rotated faster than the pre-set limit. By adding the emergency break-out system, a clear, unimpeded evacuation path through the revolving door can be achieved. The electromechanical release can be integrated with a fire alarm. This release also en¬sures that the door leaves collapse only when required and not under wind pressure. The break-out system can also be very useful under less dramatic circumstances, for example when bringing long objects through the entrance.